Sarek national park is located in the Swedish part of Lapland to the north of the Arctic Circle. Although (or should I say because?) I had visited the area already last year I returned this year to walk a different route and spend again two weeks in one of the most remote areas of Europe. 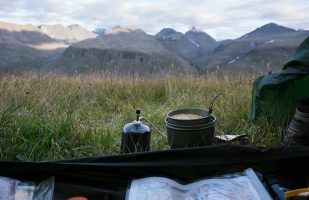 With this article I want to give you some background information on my hike, my motivation and practical aspects. No accommodations, no re-supply – you have to carry everything yourself. You may encounter streams that are hard and dangerous to cross. Last year’s trip left such an impression with me that I decided to return this year. Now that I am reviewing the pictures of my recent hike, I know for sure that I will return again. There is so much left to explore and even the places I know already will look distinct in different light or weather, or seen from a different angle. A longer hike in remote areas such as Sarek requires careful planning and preparation. After the decision about the region you need to get information on how to get there and when. 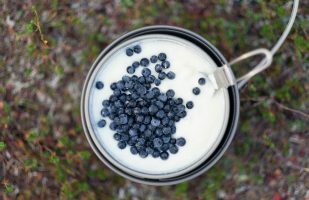 The summers are short in Lapland and if you want to hike and not ski there are only few months left: June, July, August and September. June however is a bit early for the mountains as the snowmelt is still in progress and most rivers will have high water levels making fording difficult. Of the remaining period I opted for the end of August/beginning of September. 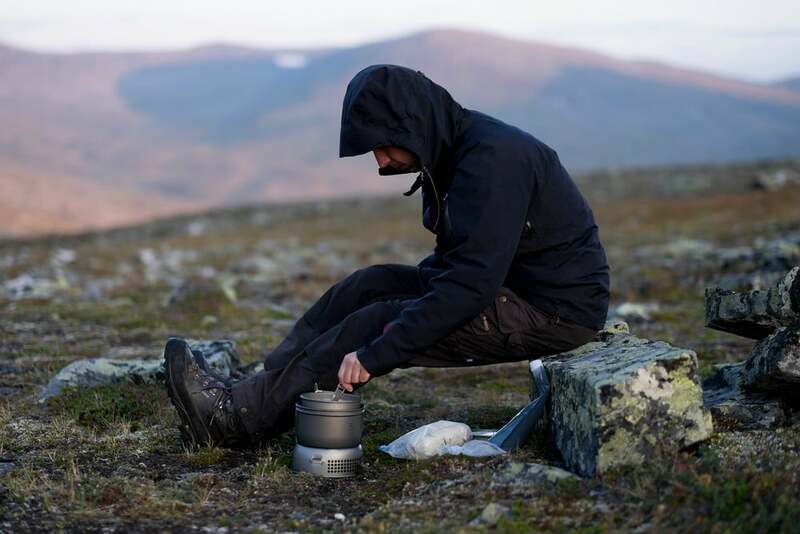 The advantages are that there are only few or no midges left and the risk of snow is still low. In addition, you can expect lower water levels if it is not too rainy. After this initial planning it is time to investigate possible hiking routes. This requires at the least a detailed map. In an area without marked trails, however, a map alone does not suffice because it is not always clear which areas can be traversed and which cannot. Often streams can only be crossed in specific places which is not evident from a map. You can either research this information in the net, contact hikers who have been already there or buy a book. I took the latter option and consulted the very detailed guidebook from Claes Grundsten which is currently available in Swedish and German. 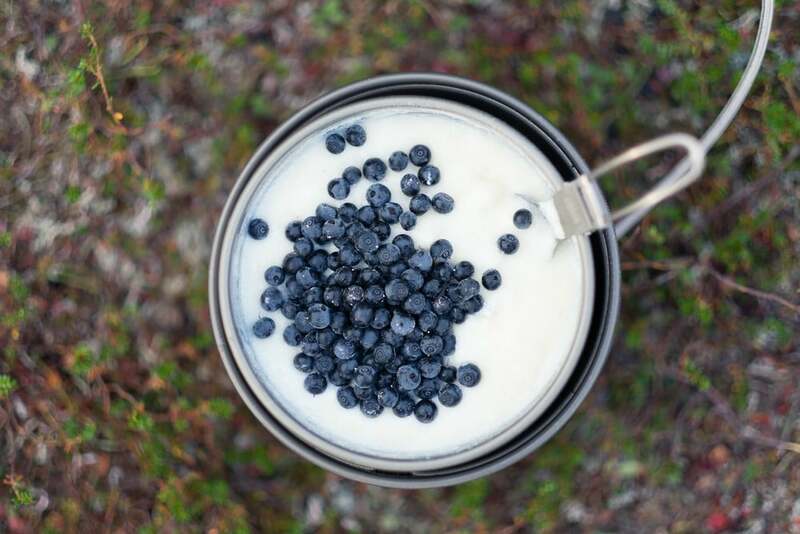 When hiking in Sarek you need to carry everything you need with you. Depending on the time you spend there this leads to a heavy backpack, especially if you also want to bring camera gear. In my case I had an initial backpack weight of about 29 kg of which 12 kg was food only. Your tent should be fit for harsh weather conditions and your sleeping bag be warm enough for temperatures slightly below freezing. The nights might be quite cold, especially if the sky is clear. I often had hoarfrost in the morning. Better take more durable gear than lightweight but weak equipment because your life may depend on it. Hiking poles or a hiking staff are a necessity when crossing streams and help when hiking with heavy backpack. Water is available everywhere; it is drinkable without any treatment and tastes good. Regarding photographic equipment, everyone has to decide for him/herself depending on the his/her photographic preferences. Usually compromises due to weight are necessary. I opted for a mirrorless system camera with full-frame equivalent lenses ranging from 21mm to 85mm (3 primes). I deliberately did not bring a telephoto lens, although I could have used it occasionally. Instead I packed a tripod and filters (polarizer, solid and graduated neutral density) which have seen a lot of use. Of course you have to bring enough batteries and memory cards to last for the entire trip. One more thing that you should consider – especially if you are hiking alone – is a remote trigger as it permits interesting possibilities of self-portraits (like the ones in this article). As my camera had WiFi, I was able to use my mobile phone for this purpose. 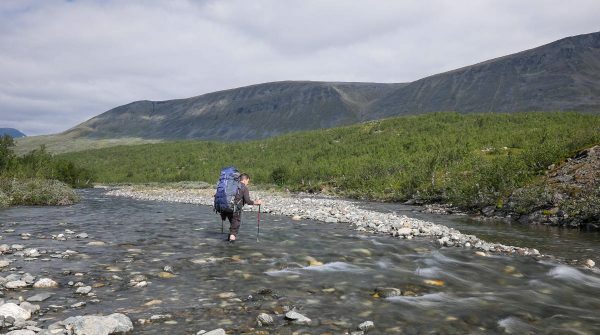 I have been lucky with the weather during both of my Sarek trips, this year even more so as there was hardly any rain which is quite unusual. Although not every day was sunny, I also had some really awesome days as you can see in the image below. However, you have to expect a lot of rain and be prepared for it. I have heard reports from hikers that have not seen a single mountain for their entire hike! The weather is also very local and may be different from one valley to the next. 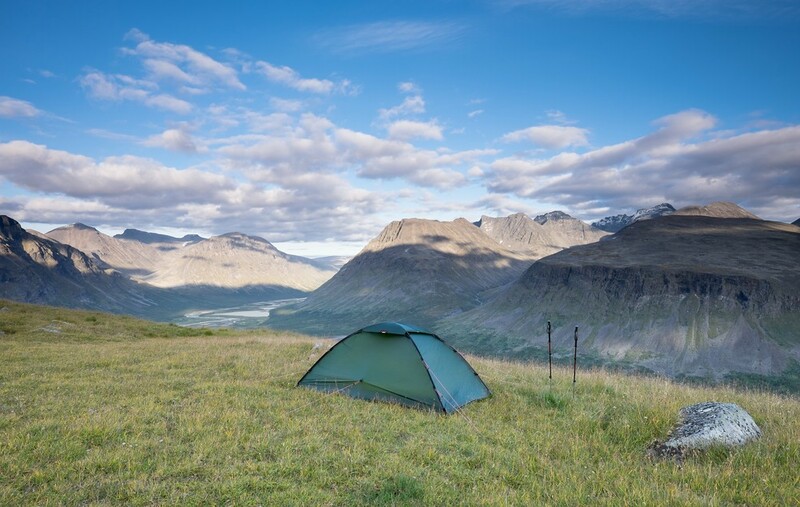 When planning your trip should take that into account and allow extra time for days you may have to spend in your tent. Luckily this did not happen to me, so I used the additional time for some detours and shorter stages. Last year I crossed Sarek national park from north to south. This year I focused on the southern part of the area, in particular I wanted to explore the valleys Njoatsosvágge and Rapadalen that I had not visited last year. As I also knew only a small part of Sarvesvágge I decided to integrate it as well. In comparison to last year’s hike the terrain was more difficult, there was much more brush and undergrowth making hiking strenuous. But I got rewarded for the effort with spectacular views of the scenery. Especially the river deltas in Rapadalen – Rapaselet and Laitaure – were really stunning. My hike started and ended in Kvikkjokk, overall I covered approximately 200 km (according to GPS data). The mileage varied between days and depended much on the terrain and other aspects such as interesting photo spots. Not the whole trek (in clockwise direction) was inside the boundaries of the national park which is highlighted green in the map below. For the return from the Laitaure lake to the east of Rapadalen I used the well-known hiking trail Kungsleden (including some pathless detour you can see in the GPS route). and many more. Some of those might take too long depending on your hiking pace. 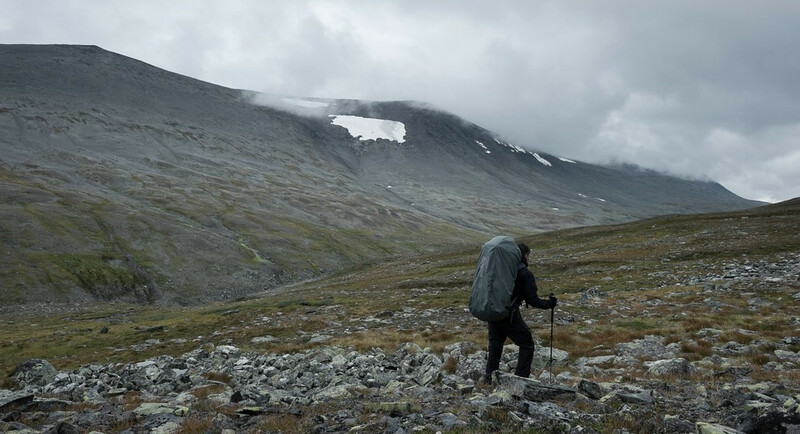 You should plan your hike in detail, to be sure that you have sufficient time and spare days for when the weather gets nasty or streams become impassable. A good reference are these online maps. Switch the type of the map to “Fjällkartan”. 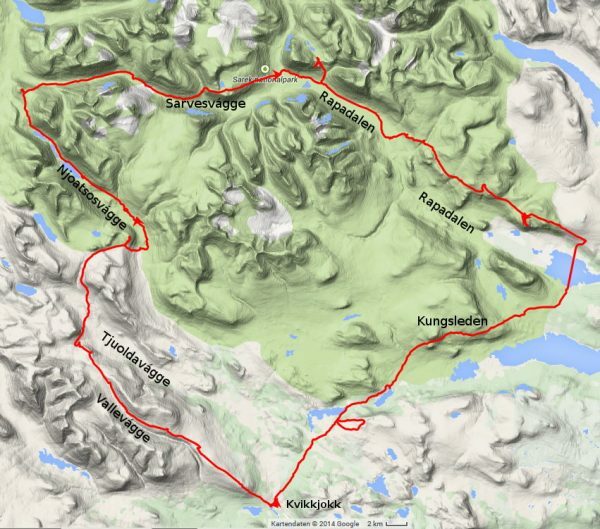 I’m planning this summer to go to Sarek and want to go through the Basstavagge valley coming from Bierikjavvre andgoing to the Suorva damm. After the valley I need to wade through Sijddoadno river to get to Suorva. I saw your route suggestions, so is that river manageable to do with my 14 year old son? Have you waded through that river? I hope you can help because I looked all over the internet for Info on this? I haven’t yet hiked this route (but I want to do that in the future). In fact, there’s no need to cross Sijddoädno, you can stay to the west of that river and hike northwards to the west of Sjuodji where you can see several small lakes. In the valley of Sijddoädno there seems to be forest/brush according to the map, so I would try to avoid it. In addition, my guidebook suggests crossing Njábbejåhkå where the letter “N” is on the map (at least when the water level is high). Nevertheless plan extra days in the case there are problems with rivers/water levels to be able to wait or choose an alternate route. I had two weeks of time, but it can be done in less. However, if you want to make some detours or take some time off, it’s always good to have some spare days. Plan for bad weather and impossible river crossings (you need to wait then or change your route) as well.